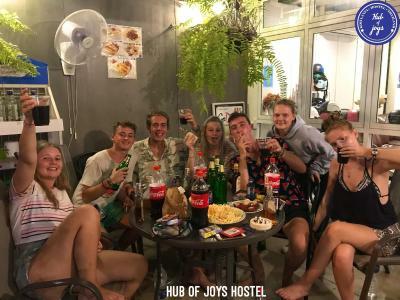 Lock in a great price for Hub of Joys Hostel – rated 9.2 by recent guests! 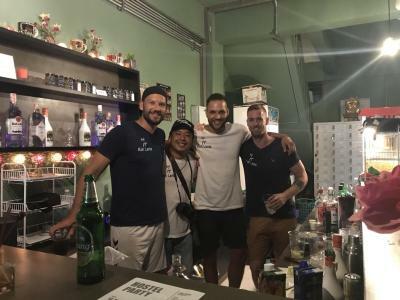 Without question, the best thing about this hostel are the people running it. 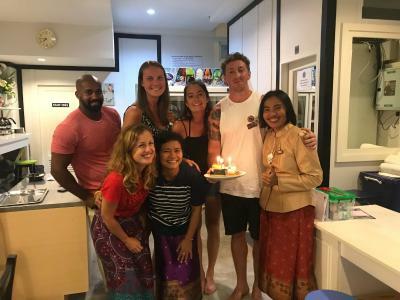 The hosts went out of their way to make everyone's stay enjoyable, gave tips, booked tours and transfer, surprised us with free donuts one day and mango smoothies the other. I booked one night here initially but ended up staying 3 as it's absolutely superb! On our last evening, me and a couple of other guests were even driven by the owner to a party on the beach we wanted to go to. And on checkout, I was given a braided bracelet and got hugged goodbye by all of them. That's the kind of hostel this is! Booked for 2 nights, stayed two weeks, definitely miss this place. 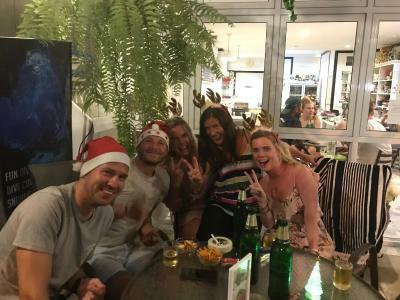 You’re part of the family <3, staff are marvellous (even helped 2 people for days who had scooter accidents! 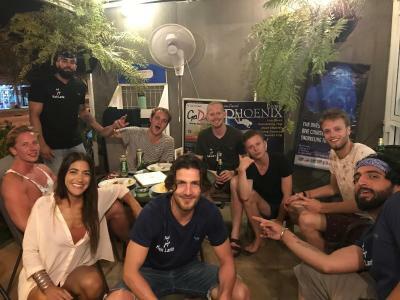 ), atmosphere is very social yet not a sloppy party, very easy to meet people- the people I met were all amazing!, dorms are quiet and easy to sleep, great location with beach close by and minimart across the street, hostel rents scooters at 200 bhat for 25 hours, a/c is good in dorms when it is on, free snacks (the popcorn is addictive) and coffee/tea all day long, drinks are same price as the market across the street, hostel has cheap food and the best chicken fried rice and chicken pad Thai I found on the island. Breakfast is made to order and much appreciated - two eggs your choice, toast, and pineapple or Tængmo <3 (watermelon). Would highly recommend this place! 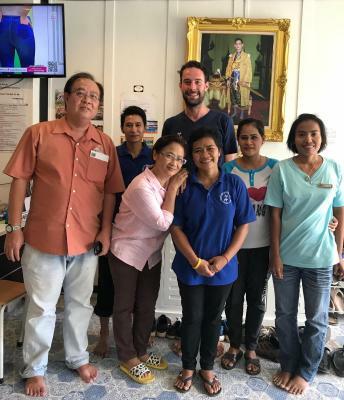 Breakfast was so perfect , best staff they are super friendly , I had a motorbike accident they did clean my wounds and first aid twice a day during all my stay with love , smiles , and without asking for any money! Wifi also was so good! Perfect for solo travelers as you will meet lots of people on breakfast and in the common area .. The beach is just 3 mins walking . Highly recommend , looking forward to stay there again! I have to say that this was actually my first-ever stay in a dorm room. I stayed in Hostels before but I always took private rooms. So this was kind of an experiment for me so I just booked 2 nights thinking that, in worst case, I can just run out tomorrow and get a room somewhere else. Well, that was exactly like ... 8-10 days ago and I'm still staying here :-) What else to say! I fell in love with this place and am actually finding it so hard to leave. And it's not just me. 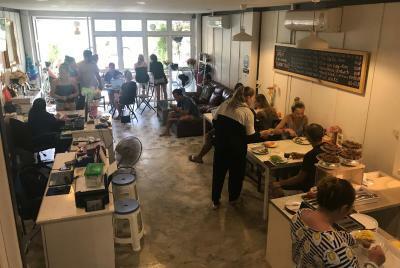 Everybody gets "stuck" in here, because everything's so chilled and cool, staff is amazing, breakfast is awesome ... it just makes you some comfortable that you slowly get too lazy to actually leave. Did I mentioned all the amazing folks I met and keep meeting here? 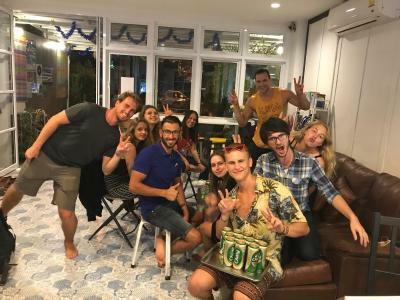 Seriously, the vibe of this hostel is AMAZING and I definitely recommend it to everyone! The receptionist was amazing. She helped me with everything from tour booking to laundry to bike rental. They have free snacks and coffee/tea available all day. Perfectly located close to Long Beach. Staff excellent and always helpful. 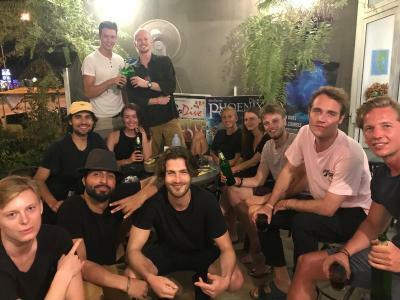 Clean fun hostel easy to meet people and affordable with a good breakfast. 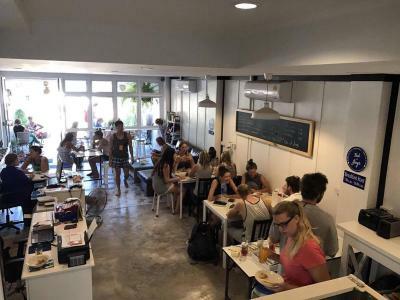 Amazing Staff, very good breakfast, you can rent the bicycle for free, near from the beach, free coffee all the time, amazing moments and Hub of Joys, i wish I could stay longer. * Snacks all day long!!! Yummy popcorn, biscuits, crackers, tea/coffe. And breakfast was really really good (eggs of your choice, fruit, toasts with butter n jam, muffins, drinks...) * Stuff is really nice. Reception lady was awesome. Guy who sold us tours was cool too. My shame, I don't remember the names. * Beds had curtains and were pretty comfortable * Laundry service is very good. Staff are excellent and so welcoming. Made me feel very looked after and helped with bookings to go to my next place. Free tea/coffee and snacks. Good breakfast. 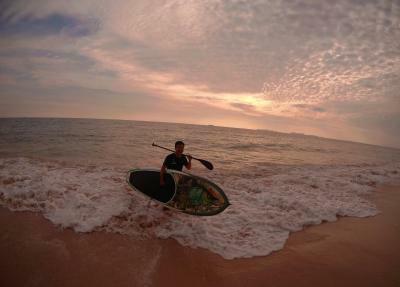 Nice location to go to long beach, only a few minutes walk. Lockers and bathroom were always very clean. I had a great time at Hub of joy! The staff was amazing and the facilities were great! 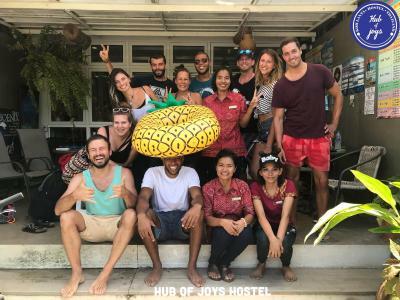 Hub of Joys Hostel This rating is a reflection of how the property compares to the industry standard when it comes to price, facilities and services available. It's based on a self-evaluation by the property. Use this rating to help choose your stay! 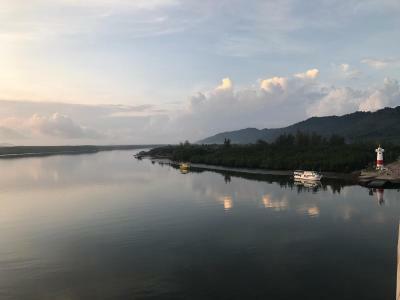 One of our best sellers in Ko Lanta! 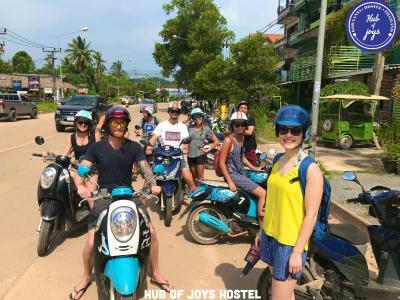 Hub of Joys Hostel is located in Ko Lanta, 2.3 miles from Saladan School, and features free bikes, a shared lounge and a bar. Among the facilities of this property are a restaurant, an ATM and ticket service, along with free WiFi. The property provides airport transportation, while a car rental service is also available. The shared bathroom is equipped with a shower and free toiletries. Guests at the hostel can enjoy a buffet or a Full English/Irish breakfast. Cycling is among the activities that guests can enjoy near Hub of Joys Hostel. Police Station is 2.5 miles from the accommodation, while Saladan Pier is 3.2 miles away. 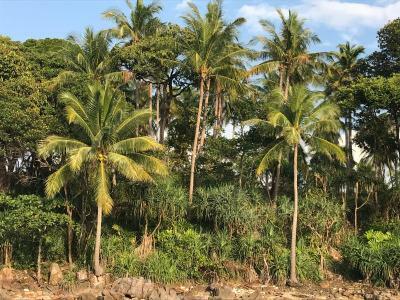 This property also has one of the top-rated locations in Ko Lanta! Guests are happier about it compared to other properties in the area. 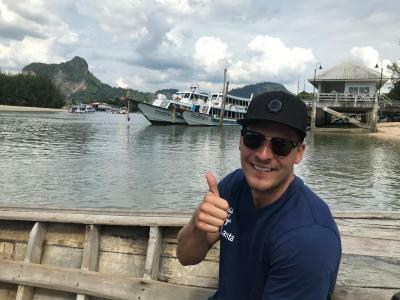 This property is also rated for the best value in Ko Lanta! Guests are getting more for their money when compared to other properties in this city. When would you like to stay at Hub of Joys Hostel? This family room has air conditioning and tile/marble floor. This family room features a tile/marble floor and air conditioning. 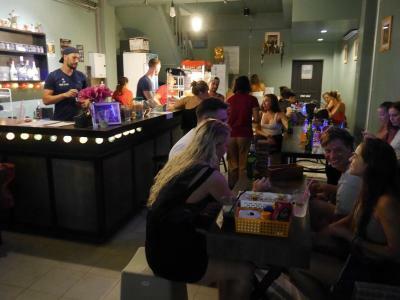 House Rules Hub of Joys Hostel takes special requests – add in the next step! Hub of Joys Hostel accepts these cards and reserves the right to temporarily hold an amount prior to arrival. Please inform Hub of Joys Hostel of your expected arrival time in advance. You can use the Special Requests box when booking, or contact the property directly using the contact details in your confirmation. Far from everything else / in a weird location relative to the rest of the island. For instance nearest 7/11 was 1 km away. Free snacks and coffee/tea all day were amazing. Great socializing area and people would play cards there all the time. Right next to Long Beach -- a couple min walk. Great kitchen with good food and the cheapest prices in the area. Kind staff. Can also book you buses etc. You need to find a place to take a rest? You need to feel like home? 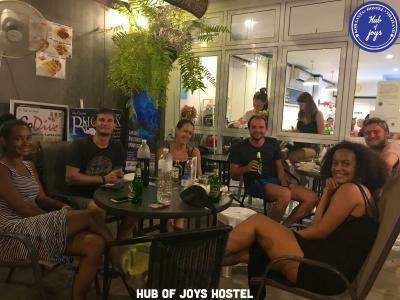 Hub of joys hostel is the kind of hostel you gonna love. Everything was perfect... The staff is adorable always helping and friendly, the breakfast is amazing. You also have free tea, coffee and delicious banana cake all day long. The food in the restaurant is cheap and tasty. It was really hard to leave this place after almost one week. Lakon and see you soon! - Nothing that I can think off! 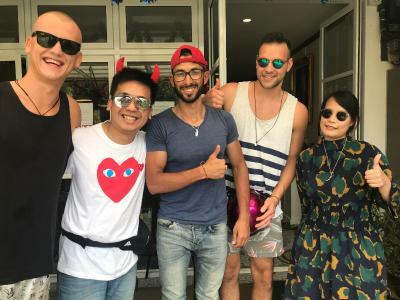 - Good location just 5 minutes away from the beach - Amazing friendly staff - Clean rooms - Free breakfast and snacks - Scooter rental and excursions on site - Very comfortable beds & extra storage and curtains giving some privacy Best staff, very friendly and it looks like they loved what they were doing. Thank you! Aircon is only on from 4pm-10am which makes the room constantly very hot and when the aircon is on its not particularly good, so can be stuffy. There are too separate buildings and it’s not clear where the reception is from the first building. Shower pressure wasn’t great but do-able. Location is good (2 min walk to Long Beach). 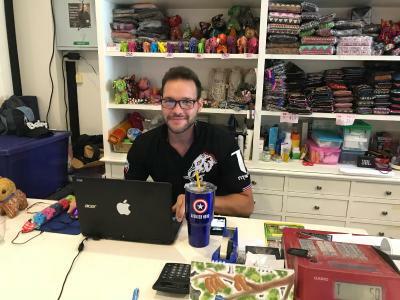 Staff are helpful and friendly! Beds are comfortable and have curtain which is good. Free bicycles which is handy! And 200 for motorbikes (per 24hours). Buy your boat tickets at the reception as they’re the cheapest tickets you’ll find! Bathroom could be a little cleaner. 1. Breakfast is really good. 2. Good location, near long beach, it takes about 5 mins by walking. 3. Staffs are super friendly and helpful. 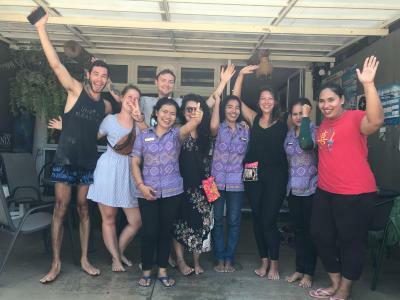 Had a few problems with slow wifi and there were a few power cuts while we stayed, but not too much of a big deal as no wifi just meant we made more friends! Also the air con is turned off pretty early so being in the rooms during the day is pretty much a no go. Best hostel ever!! The staff are so lovely and help you with any enquiries you have, the free snacks all day are a lovely extra. The hostel is a 2 minute walk from the beach and surrounded by nice restaurants. 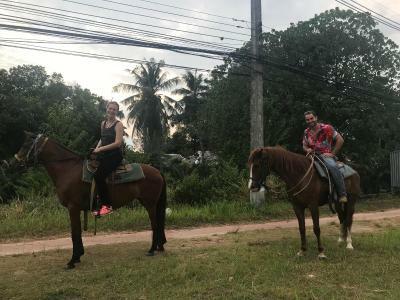 Me and my friend also made use of the free bikes from the hostel as well as the horse riding just across the road, i definitely recommend if you are staying here! Great breakfast for a hostel. 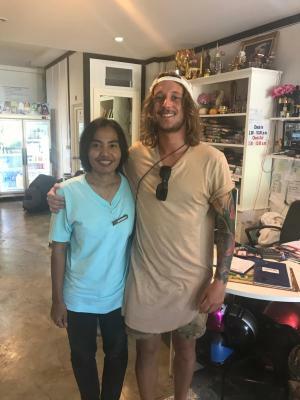 Staff super friendly and will help to get mopeds and tours. Lovely family, extremely helpful, friendly, really making sure that everyone is happy. Even drove us to a party! Breakfast is awesome, beds are comfy and new, snorkels and beach mats to borrow, free bikes! Free delicious snacks ALL DAY!! Hub of joy really is a hub of joy! 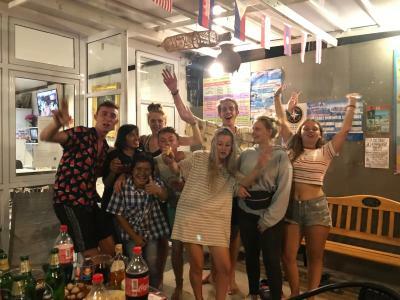 The staff were the best so far out of any hostel I’ve visited. So attentive and got to know everyone’s names. They went above and beyond, making complimentary juices and giving bracelets and free popcorn to the guests. Pong even drove us to a nearby bar because he didn’t want us to walk! So lovely. The rooms are lovely and comfortable with great air con. 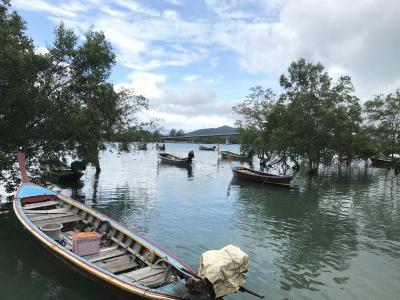 Don’t stay anywhere else in Koh Lanta! You won’t beat it. Was meant to stay here for 3 nights but ended up with 10. Loved staying here cause I felt in love with this place and the people who are running this business. Warm-hearted and very friendly family! The whole atmosphere is great. 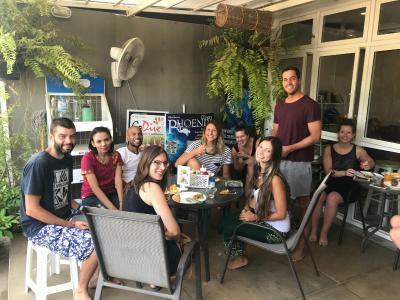 Clean hostel with comfortable beds. Best breakfast I’ve ever had in Thailand! 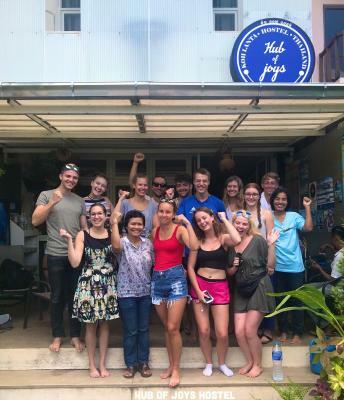 Would highly recommend this hostel to everyone! Literally nothing not to like about this hostel. Bathrooms can have a smell if the doors are kept shut.